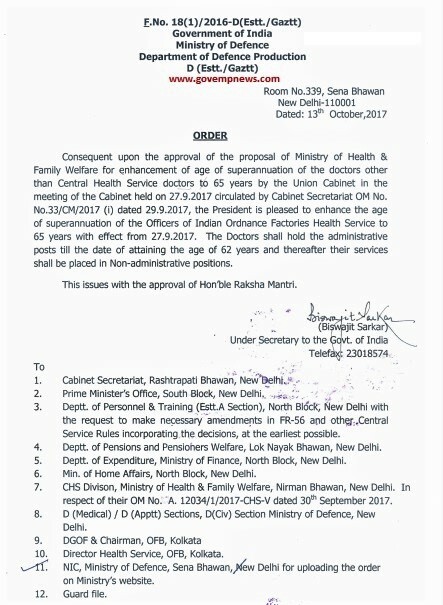 Consequent upon the approval of the proposal of Ministry of Health Family Welfare for enhancement of age of superannuation of the doctors other than Central Health Service doctors to 65 years by the Union Cabinet in the meeting of the Cabinet held on 27.9.2017 circulated by Cabinet Secretariat OM No. No.33/CM/2017 (i) dated 29.9.2017, the President is pleased to enhance the age of superannuation of the Officers of Indian Ordnance Factories Health Service to 65 years with effect from 27.9.2017. The Doctors shall hold the administrative posts till the date of attaining the age of 62 years and thereafter their services shall be placed in Non-administrative positions. 3. Deptt. of Personnel & Training_(Estt.A Section), North Block, New Delhi With the request to make necessary amendments in FR-56 and other_Central Service Rules incorporating the decisions, at the earliest possible. 4. Deptt. of Pensions and Pensioners Welfare, Lok Nayak Bhawan, New Delhi. 6. Min. of Home Affairs, North Block, New Delhi. 7. CHS Divison, Ministry of Health & Family Welfare, Nirman Bhawan, New Delhi. In respect of their OM No. A-12034/1/2017-CHS-V dated 30th September 2017. 8. D (Medical) / D (Apptt) Sections, D(Civ) Section Ministry of Defence, New Delhi. 10. Director Health Service, OFB, Kolkata. 11. NIC, Ministry of Defence, Sena Bhawan, New Delhi for uploading the order on Ministry’s website.